About ten years ago computer graphics research and computer games development were two totally separate areas with not much common ground. Computer games have always been almost exclusively targeted at the consumer market, and the graphics capabilities of consumer hardware at that time were practically non-existent from the point of view of computer graphics researchers. Thus, researchers were using expensive high-end graphics workstations, and game developers were targeting entirely different platforms. This had the implication that algorithms and techniques developed and used by the computer graphics research community could not really be employed by game developers. Graphics researchers, on the other hand, also did not view computer games as an application area of their scientific work. However, the last decade, and the last couple of years in particular, have seen low-cost consumer graphics hardware reach - and in many areas even surpass - the capabilities of extremely expensive high-end graphics hardware from just a short time ago. This has led to computer game developers increasingly utilizing the scientific output of the research community, with an ever diminishing delay between introduction of a new technique and its actual use in a consumer product. Computer games research and development has thus become a very important application area for graphics researchers. Given these very interesting developments, we will have a look back at how 3D graphics technology has been used in computer games over the last eight years. We will have a look at several seminal 3D computer games during that period - games that really shaped the entire industry and heavily influenced what was to come after them. In doing so, we will discuss the most important graphics techniques employed. A very important topic is the transition from exclusively using proprietary software-renderers to the wide-spread use of 3D hardware accelerators. Thus, we will also have a detailed look at the most important consumer graphics hardware of the last several years. We will try to wrap everything up with a tentative look into the future. This talk consists of three distinct parts. Part One gives an overview of the most influential computer games of the last eight years, starting in 1992 with Looking Glass Technologies� Ultima Underworld, the first fully texture-mapped 3D computer game. 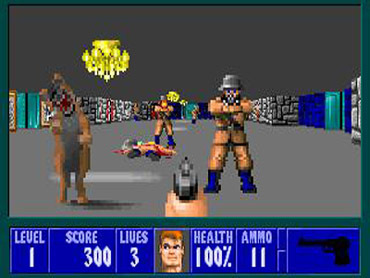 Where Underworld�s technology was somewhat ahead of its time and thus not able to offer very high frame rates, a technologically much more restricted action game with somewhat questionable game content, Wolfenstein 3D by id Software had a much higher impact in the long run. 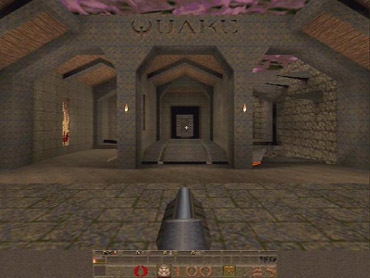 It became the prototype for tremendously successful games like Doom and Quake and founded the genre of first-person shooters. 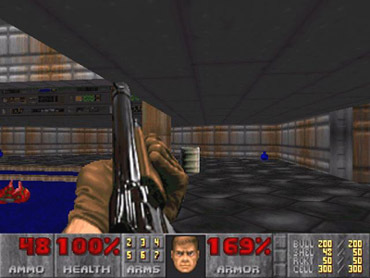 Doom was the first fully texture-mapped 3D action game. 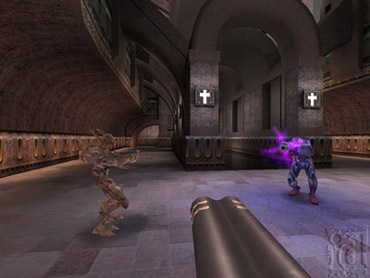 Released by id Software in late 1993, it brought about the breakthrough for fast real-time 3D games on consumer hardware and is still one of the most successful computer games of all time. Where Doom�s world geometry was still highly restricted, in 1994 Descent by Parallax Software offered a true 3D, six degrees of freedom game environment for the very first time. In 1996, id Software released their next groundbreaking 3D game, Quake. Its 3D engine offered very complex geometry in a true 3D environment and introduced a large number of advanced graphics algorithms to the game development community. 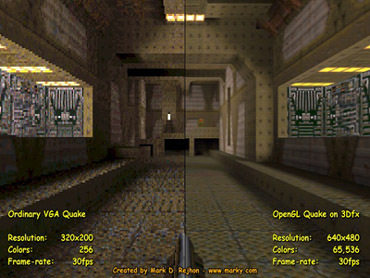 Like all earlier computer games, the original Quake used a proprietary software-renderer, but still in 1996, the OpenGL version of Quake, GLQuake, together with the Voodoo Graphics accelerator by 3dfx Interactive achieved the breakthrough for consumer 3D hardware acceleration. We will conclude Part One about seminal 3D computer games with the current state of the art: id Software�s Quake 3 Arena. Part Two gives an overview of the evolution of consumer 3D hardware accelerators, starting with the Voodoo Graphics by 3dfx Interactive in 1996. We will also have a look at Glide, the proprietary graphics API for 3dfx hardware, and discuss why this API was crucial for the Voodoo Graphics� success. Other accelerators we will cover in detail are the Voodoo 2, the Riva TNT by NVIDIA, and the GeForce 256, which is the current state of the art in 3D hardware acceleration. This accelerator by NVIDIA marks the point in time where consumer hardware has finally surpassed expensive high-end graphics hardware of just a short time ago in nearly all respects. Part Three will conclude with a few additional topics and also try to provide a tentative look into what the future might hold for consumer 3D hardware acceleration, 3D computer games technology, and the relationship between computer graphics research and computer games research and development.